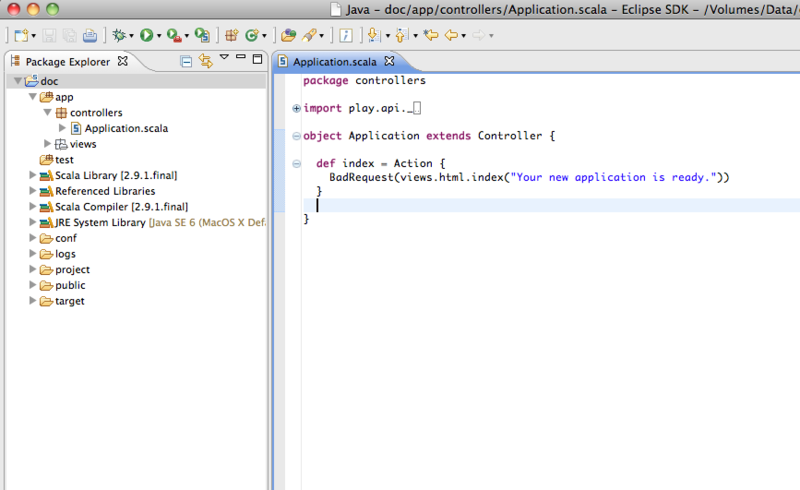 To debug, start your application with activator -jvm-debug 9999 run and in Eclipse right-click on the project and select Debug As, Debug Configurations. In the Debug Configurations dialog, right-click on Remote Java Application and select New. Change Port to 9999 and click Apply. From now on you can click on Debug to connect to the running application. Stopping the debugging session will not stop the server. Tip: You can run your application using ~run to enable direct compilation on file change. This way scala template files are auto discovered when you create a new template in view and auto compiled when the file changes. If you use normal run then you have to hit Refresh on your browser each time. Intellij IDEA lets you quickly create a Play application without using a command prompt. You don’t need to configure anything outside of the IDE, the SBT build tool takes care of downloading appropriate libraries, resolving dependencies and building the project. Play 2 plugins are enabled in IntelliJ IDEA. Open New Project wizard, select Play 2.x under Scala section and click Next. Enter your project’s information and click Finish. IntelliJ IDEA creates an empty application using SBT. You can also import an existing Play project. - Open Project wizard, select Import Project. - In the window that opens, select a project you want to import and click OK.
- On the next page of the wizard, select Import project from external model option, choose SBT project and click Next. - On the next page of the wizard, select additional import options and click Finish. Check the project’s structure, make sure all necessary dependencies are downloaded. You can use code assistance, navigation and on-the-fly code analysis features. You can run the created application and view the result in the default browser http://localhost:9000. - In the project tree, right-click the application. - From the list in the context menu, select Run Play 2 App. You can easily start a debugger session for a Play application using default Run/Debug Configuration settings. Play does not have native Netbeans project generation support at this time. Enter ‘gen-ensime’ at the play console. The plugin should generate a .ensime file in the root of your Play project. From Emacs, execute M-x ensime and follow the on-screen instructions. That’s all there is to it. You should now get type-checking, completion, etc. for your Play project. Note, if you add new library dependencies to your play project, you’ll need to re-run “gen-ensime” and re-launch ENSIME. Check out the ENSIME manual at http://ensime.github.io/ensime-src/index.html. If you have questions, post them in the ensime group at https://groups.google.com/forum/?fromgroups=#!forum/ensime. Scala is a newer programming language, so the functionality is provided in plugins rather than in the core IDE. IntelliJ IDEA’s plugin is under active development, and so using the nightly build may give you additional functionality at the cost of some minor hiccups.